When you stay at a Hollies Forest Lodge, the emphasis is on relaxation and luxury. All of our lodges are decorated to the highest standards and beautifully equipped with everything you need to truly make this a getaway to remember. 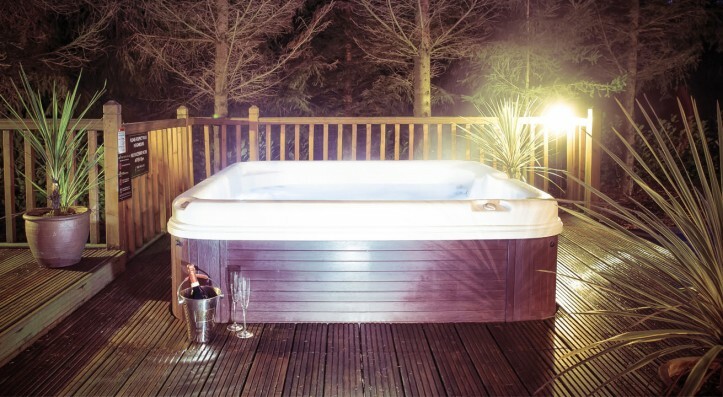 Outside, the hot tub will be ready no matter the weather, constantly maintained to the optimum temperature for an indulgent dip. For the warmer days of the year there is the decking area which is furnished with large tables and seats as well as a Green Egg BBQ for perfect cooked meats. Whether you are staying with family or friends, there is always something to do, and after a packed day you can refresh yourself in our wonderful Coffee Shop or visit our Farm Shop for some delicious treats and ingredients to cook up a feast. The Hollies Forest Lodges are in the perfect location. Our site, in a landscaped forest, is nestled in the heart of the peaceful Cheshire countryside. If rural is your thing then Delamere Forest is just a stones throw away while Tatton Park and Dunham Massey are within easy reach. A little further afield is North Wales, home of the magnificent Snowdonia National Park. If you prefer city life and hitting the shops then Chester, Manchester and Liverpool are easily accessible by road or rail. If you’re planning an active getaway then you will be spoilt for choice. The Hollies Forest Lodges are close to some of the county’s finest golf courses such as Tarporley and Sandiway. With three of our Lodges sleeping 6 people and two of our Lodges sleeping 4, there’s more than enough room for you and your playing partners to stay together and enjoy a BBQ at the end of the day on your private deck. Cheshire is also home to dozens of cycle paths and bridal ways, the perfect way to take in the wonderful countryside, including Delamere Forest which is approximately 3 miles away from The Hollies. Three of our Lodges sleep up to six people and two sleep up to 4 people. Accommodation in the larger Lodges consists of a master bedroom with en-suite, two further bedrooms and an additional bathroom. In the smaller Lodges, accommodation consists of a master bedroom, a twin or double and a Jack & Jill bathroom between. The cosy open plan lounge and dining area in all of our Forest Lodges has a log burning stove as its centre piece, while the kitchen comes fully fitted and well equipped. You can even choose to have a selection of essentials from our Farm Shop waiting for your arrival.